I'm writing this as the snow falls outside my window, a great way to end the weekend. We don't have to leave the house, the neighbors are outside building snowmen and shoveling their driveways, giving us that rare opportunity for some winter interaction. Earlier, I thoroughly enjoyed a run through the neighborhood trails and parks, all covered in white. 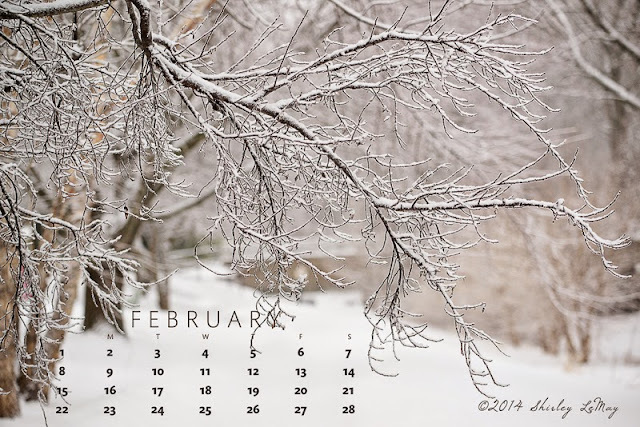 So, it seems appropriate that this month's free calendar download features a snow scene. I took the photo last year, amidst one of the coldest and snowiest winters I've experienced in our 12 years living here. While I don't wish for a repeat of all that snow, I am happy we are getting some of the white stuff today. Beautiful. Printing it out again to hang by my desk. Thank you!